Thirsty Pilgrim: Westvleteren 12 to Hit Supermarket Shelves for Limited Time. 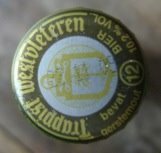 Westvleteren 12 to Hit Supermarket Shelves for Limited Time. Beer-savvy Belgians will be buying newspapers on November 3 and clipping a very special little coupon. They will then take that coupon to the nearest Colruyt supermarket and, in orderly fashion no doubt, use it to purchase a six-pack of Westvleteren 12 and two Westvleteren glasses for €25 (about US$33). Here is the news (in Dutch) from the Standaard (with a hat tip to Jimbo at the BBB). Or here you can read it in French from Le Soir, which is where I nabbed this promotional photo. Check out the new roman numeral branding on the glasses and bottles. I don't know... I think I liked it better when they just recycled the ring-necked Westmalle bottles (among others) and left them label-free. Those with good memories will remember hearing about this Colruyt possibility nearly a year ago. My hope then was that this would somehow take the steam out of the absurd gray-market sales, but that seems unlikely since this appears to be a one-off deal. There will be 93,000 of these special little "brick" boxes for sale, with all the proceeds going to a major reconstruction project at the abbey. The monks have resisted selling their ales outside the abbey walls for a very long time, in the face of much international hype that would have increased the market value. It's easy to imagine them fretting over where to get the funds for their renovations when they have been sitting on the gold mine all along. For more Thirsty Pilgrim posts on Westvleteren, click here. They include what is by far this site's most-visited post ever on how to get the stuff the legal way (as in, one to three cases of of it) from the abbey. $220 starting bid. Or buy it now for $265. Now bad for something which sold (out) this morning at $33.